The Week in HD - Tuesday 26th February | What Hi-Fi? Hi everyone, welcome to The Week in HD - our guide to all the must-see TV shows, films, sports and Blu-ray releases to grace your screens over the next seven days. Apologies for being a day late - we've all just come back from another great annual Bristol Show - check out our news coverage of the show to keep up with all the shiny new tech that was on display. 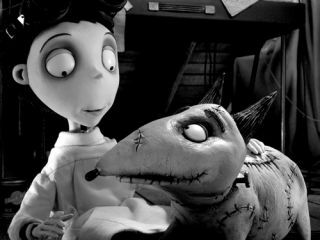 Tim Burton is at his best with stop-motion animation, and here he goes back to his roots with this charmingly macabre and touching re-telling of the Frankenstein story, this time with a young boy scientist bringing his beloved dog back to life. It's black and white, comes in 3D, and has plenty of horror tropes and references to thrill fans and casual viewers. Dirty Laundry. CBS's take on a modern-day Sherlock Holmes is back from its mid-season break, with Jonny Lee Miller's consulting detective solving a rather mundane case in NYC, but his sparkling chemistry with Lucy Liu's Joan Watson (who might or might not be leaving Holmes) makes you keep watching. Sue Perkins writes and stars in this new comedy about Sara, who is just about to turn 40, and is frustrated at dealing with dead cats, a netball referee and an anxious mother. Worst of all, her friends are planning a surprise birthday party for her big day… which includes a 'dramatic ultimatum'. Also stars Nicola Walker (Ruth from Spooks) and Joanna Scanlan (Terri from The Thick Of It). I think the BBC misses MasterChef as much as I do, because it's put this treat on the menu: a behind-the-scenes look at all five series of MasterChef Pro. Michel Roux Jr, Gregg Wallace and Monica Galetti take us through the highlights and lowlights, including the best and worst dishes, and what it's like to take part and be judged in the show. The Greater Good. Honolulu Heights becomes rehab central when Crumb (the vampire turned by Hal) comes to stay, and Tom takes on the difficult task of reintroducing werewolf Bobby to the normal world, one which Tom barely knows himself. Surely, the greatest show title ever. First, there's a man called Johnny Kingdom. Second, he's going to film bears fishing for salmon. In Kodiak Island, Alaska. This is bascially the Jeremy Clarkson version of all the cute and cuddly penguin shows. All In. Harvey and Mike go off to Atlantic City - in suits! - to take on a rather unorthodox case. Meanwhile, Jessica tries to iron out issues with an old univeristy classmate, and Louis and Rachel team up with their love of ballet to save an institution from ruin. Charlie and friends take a balanced, sympathetic look at the week's film, TV, internet and news. Not really - they rip it all to shreds. The greatest action film of all time. OK, of the 90s. Back when Michael Bay was doing things right (apart from understanding gravity) and JJ Abrams was still flexing his writing skills, this film offered a perfect mash-up of blockbuster explosive action, a daft but entertaining storyline, colurful and interesting characters, a fantastic ensemble cast, and a cracking soundtrack by Aerosmith. An earth-destroying asteroid is about to hit the planet in 12 days, and NASA turns to deep-sea oil drillers to save the world. Obivously. Starring Bruce Willis, Liv Tyler, Ben Affleck, Steve Buscemi, Michael Clarke Duncan, Owen Wilson, Jason Isaacs, Billy Bob Thornton and Peter Stormare in a ridiculous amount of fun and silliness. The Popular Age. In the final episode of the series, we journey from Gershwin's Rhapsody in Blue, to Shostakovich's Leningrad Symphony, to the influences of The Beatles and David Bowie on modern classical composition, and end up with Steve Reich/Philip Glass/John Adams in the 60s and 70s - an inevitable convergence of classical and popular music. Another spooky and chilling turn from M Night Shyamalan, with mystical crop circles cropping up on a former-preacher-turned-atheist's farmyard. Starring Mel Gibson, Joaquin Phoenix and Abigail Breslin. It'll be a good test of your screen's black levels. In this two-part finale, the boys go on an epic journey in Africa to find the source of the Nile. Of course, numerous explorers have done just that, but Top Gear believes it can do better. By going further and faster than any exploration team ever before… in the world. With three ageing presenters in three ageing estate cars. Let the race begin! Unless you were living under a rock, which would be ironic, you'll have heard and seen the spellbinding reports of Russia being hit by a giant, flaming piece of sky. Or, to be more precise, by a meteor. Professor Iain Stewart takes us through what meteors and asteroids are, where they come from, and the danger they pose to all of us on Earth: the meteor that hit the Ural mountains, for example, exploded with the force of 20 Hiroshimas. Take note, Michael Bay.